You are here: Home / Product Reviews / Babies & Kids / A Story in Every Bowl: Bring Imagination to Life & Try the NEW Alpha-Bits Cereal. I don’t know about you but, Post Alpha-Bits brings back so many memories for me. I used to have so much fun in the morning with a bowl and a spoon. It was pure excitement to see what I could come up with. I would move the letters around and create words or phrases and of course–spell out my name! You know we have all done that. The truth is that there’s a story in every bowl. Post Alpha-Bits cereal starts a child’s day with limitless possibilities. The Alpha-Bits shapes are a fun way to bring their imagination to life as each new bowl holds a story waiting to be told. To be able to share this same excitement with my girls in the morning is a joy in itself. It makes me happy to see them have as much fun as I did when I was their ages. That’s the thing about Alpha-Bits cereal; it has the great taste and alphabet delight that kids and moms L-O-V-E. But, did you know that Post Alpha-Bits cereal provides a source of 9 essential nutrients plus is an excellent source of Iron and Thiamin? That my friends, shows you that Alpha-Bits cereal are more than just fun and games. 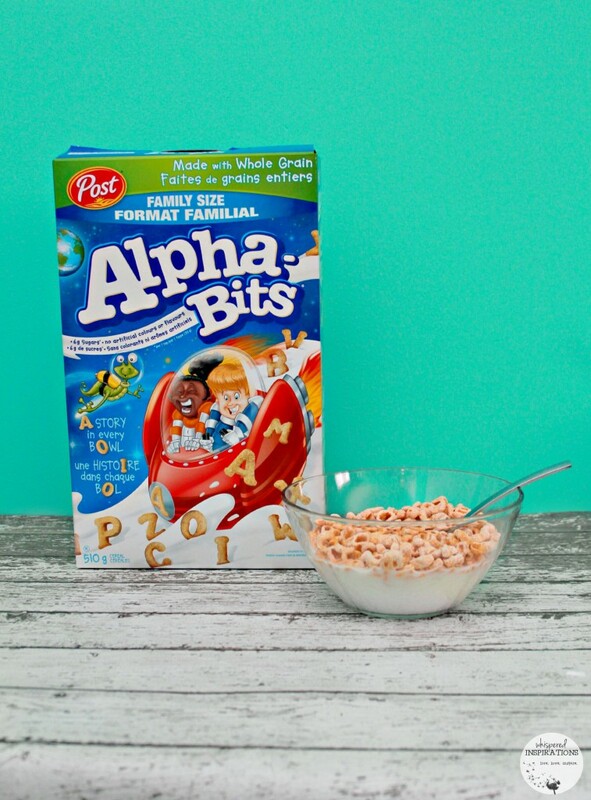 I’m super stoked to share that Post Foods Canada Inc. recently revamped its Alpha-Bits cereal with 40 per cent less sugars than the original Alpha-Bits. It is still made with whole grain, without the addition of artificial flavours and is a source of fibre in a 1 cup serving. This news makes me very happy as a Mom because like many parents, I want to be able to give my girls a balanced diet. Since Alpha-Bits cereal now has 40 per cent less sugars, it really makes a world of difference. The cereal now has 6 g of sugars per 1 cup (30 g) serving size, down from 10 g in the original. Artificial colours have also been removed which is a huge plus. What’s more is that Alpha-Bits cereal will now have less sugar per serving than any other leading competitive Sweet Kids cereal. Breakfast is the most important meal of the day and Post knows that families across Canada are concerned about providing healthier breakfast options to their children, so they set out to make it easier for parents to do that by reducing the sugars in Alpha-Bits cereal. I go one step further and I serve fresh fruit and protein along with the cereal, that way they start their day with all the fuel they need! Just in time for the new school year, you can find the new Alpha-Bits cereal in participating grocery stores across the country. It will be available on store shelves nationally! We picked up a box to enjoy this month and we love it. I have to admit; I snuck a bowl or two and slipped into nostalgia for a short while. I had forgotten how tasty it was (and how fun), I might have to sneak some from my daughter’s more often! Stay tuned for a spooktacular surprise with Post Alpha-Bits in a fun giveaway coming your way in October! For more information about the new Alpha-Bits, you can visit postfoods.ca. Full nutritional information and recipes are available there! How do you eat your Post Alpha-Bits? Note: New Alpha-Bits has 6 g of sugars per 1 cup (30 g) serving size compared to original Alpha-Bits with 10 g of sugars per 1 cup (30 g) serving size. New Alpha-Bits cereal has 6 g of sugars per 1 cup (30 g) serving vs. 9 g of sugars or more per stated serving size in the leading competitive brands in the Sweet Kids segment based on top 10 Franchise $ Share ranking in the L52weeks to August 22, 2015. My kids love Alpha Bits so I am glad that the amount of sugar in it was reduced. We do enjoy a bowl of Alpha Bits from time to time, I am really happy with the changes they have made to them! It is awesome to see the changes, that is for sure. Me too! It makes it a much healthier option in the morning. I like to keep the sugar at a minimum. Definitely, 40% less sugar is a lot! I have awesome memories of eating Alpha-Bits as a kid so it is great to see it making a comeback. I like that it enables kids to have some educational fun with their food too! I remember this cereal from when I was younger spelling words out!! I am going to have to pick some up for my kids to have! I was so much FUN, huh? I totally forgot about this cereal. I loved it as a kid and I bet my kiddo would love it too. Thanks for the reminder of this cereal I might have to go get some. And now with less sugar, it is even better! This looks like fun! I bet my kids would really have a blast with it!! I really do not know what kid would not have a blast with it! Yum my kiddos love alphabits! We haven't had it in a while, and I had no idea there was a new one! I will have to pick it up this weekend! I used to love alpha bits when i was younger! I'm happy to see they lowered the sugar content. My little guy is very sensitive to sugar. Who am i kidding, i'd probably eat these all to myself! Haha, I am with you on that one! I loved Alpha-Bits when I was a kid. I would buy them and use them for my first graders, but they would eat most of the words they spelled. My kids would love to try to make words in their bowls. Haha, that is so cute. I imagine they are great for crafts! I haven't seen alphabits cereal in forever. I used to love that stuff as a kid. I love the reduced sugar option. Me too, less sugar makes a big difference! My kids use to love Alpha Bit s when they were younger. I need to give them a try with the reduced sugar. They are really good, still sweet and delicious. We'll have to try this out! I like serving fresh fruit along with cereal too. Me too, makes it even better! Haha, I love hearing that. I so need to get this cereal for my kids. I could have them spell words while they eat it! That would keep them busy for sure. My girls love this! They have so much fun picking the letters and pronouncing them. Post makes delicious cereals. Alpha Bits is delicious with sliced strawberries and blueberries in it. I agree, that is how we enjoy it! My kids love Alpha Bits cereal. They like to spell words in their spoons. I remember eating it when i was a kid. Me too, glad we get to share it with our kids. My kids love identifying and playing with letters! This is a great tool for them to learn from and eat! I haven't had Alpha Bits in many years. I remember loving them as a child. I loved Alpha Bits when I was younger, but I've never fed it to my kids because of all the sugar. I guess my kids will be able to enjoy the goodness now. Thanks for sharing. I am glad they made it even better and with less sugar! I used to love Alphabits cereal!! I didn't know they actually still made this. I am going to have to find it for my kids. My recent post Fueling a Healthy Life &amp; A Giveaway Too! They improved it so, now you will enjoy it even more! Breakfast is definitely important. I was just thinking yesterday that I have not had a bowl of cereal and cold milk in a long time. My go to lately has been eggs for breakfast. You must miss it! Grab a bowl! I remember Alpha-Bits from when I was a kid! It makes me very happy to hear they are now making it with 40% less sugar. Kids don't need all that sugar to wake up! The girls love Alphabits. They would ask for this every time we go to the grocery store. I don't really give sugary cereal to my kids. I usually offer toast, oatmeal or crepes. I used to love alphabits as a kid though. As with everything, moderation is key! I think Alpha-Bits makes for a delicious breakfast and treat if you do not often give them cereals. Yum! I am definitely going to be picking up some of this cereal for me and my family! My recent post LeapFrog makes homeschooling fun! Me too, so many good memories! I think it's great that these large companies are making healthier choices and changing the ingredient list in their products accordingly! I am glad that they take into account what families are after in the present! Wow, I'm already excited about this product. Think it's perfect for toddlers plus they can learn while eating. It really can help with learning the alphabet! I love Alpha-Bits! I used to eat them as a kid and loved make words in my bowl. That is exactly what I do! 40% less sugar is a LOT less! We don't do cereal alot because of the sugar, but I'll try Alphabits again. It's been years since I've had it. It is a LOT less for sure! Enjoy! Oh wow, how about that! That would make eating cereal a lot exciting. That is exactly what we did! It was so much fun. OH man, I haven't had Alpha Bits for so long. I am really wanting to have them now. That takes me way back! Omg I’m so looking for this on grocery shopping day! My daughter just mastered her ABC’s so this will be perfect for her! i love this… i never ate them growing up but my daughter LOVES spelling any and everything. This is way cool! I didn't eat/play with this cereal when I was young. Maybe we did have it here in the Netherlands but my parents never bought us cereal. 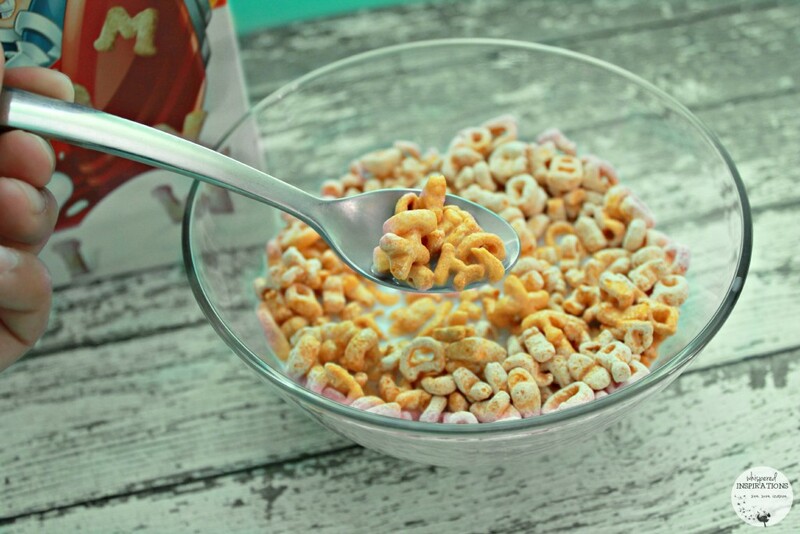 Finally with this cereal Moms can be happy when a child play swith their food. I'm glad that they reduced their sugar content. Alpha Bit looks like a fun meal for kids. I have actually never had this cereal before. I think I might try this with my 3yr old. She's open to most things, the older kids already have their favorites. I love that they dropped the sugar! My sons behavior changes due to sugar so we have to keep it low and he loves spelling. Sounds like a great afternoon snack. Me too, it really makes it much more enticing. Glad they did! I haven’t had this cereal in a long time. I loved it when I was growing up. It was fun coming up with words. Oh my goodness, me too! Love that this is made with less sugar now and increased fiber. Just might grab a box of these the next time I am at the store! I totally agree! Enjoy your Alpha-Bits! Oh wow! I forgot all about this cereal. I'm not even sure If I have seen it recently? I will have to look for it the next time I'm in the store. I bet my kiddos would love this too. 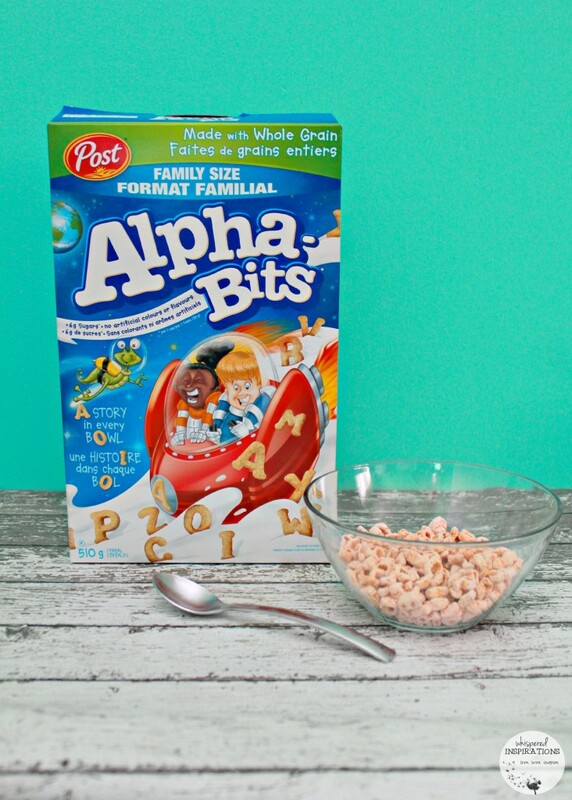 I haven't had Alpha-Bits in such a long time, but I do remember stringing together words using the cereal. Does this cereal come with marshmallows too? I've been on a kick with that lately and would get some if they did. I dont think I used to eat these. I do love things that bring back childhood memories. I saw that coconut snowballs the other day… my mom would always buy them for me because I used to looooove them. Definitely love nostalgia, especially if it is tasty. This sounds like a cereal that the both of my children would love. I'll definitely have to check it out! Yes, they will enjoy it! Wow 40% less sugar, that's awesome great to know that they are making healthy changes!